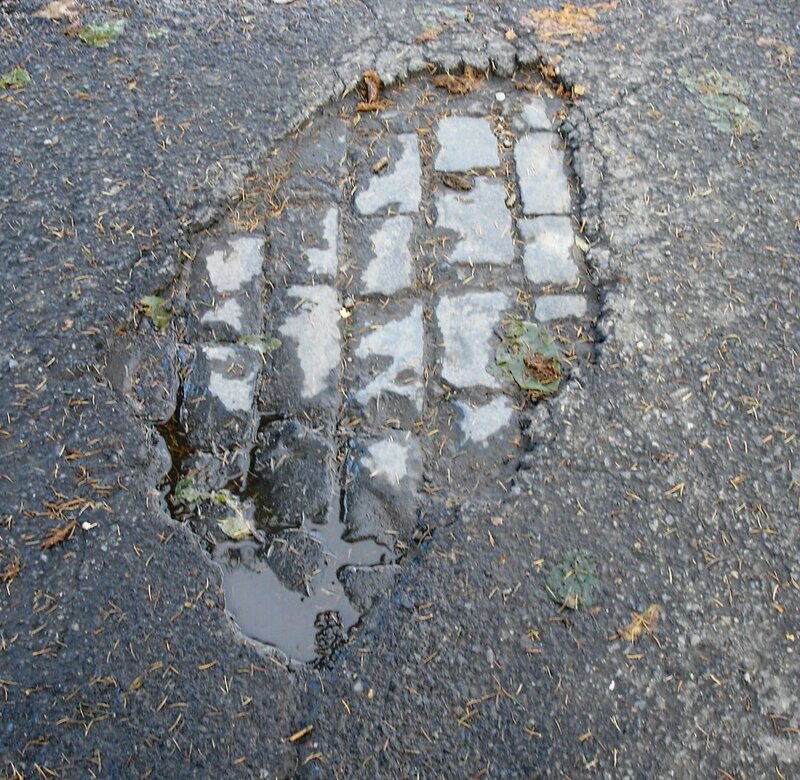 One of my favorite web-sites is Forgotten New York, where obscure or hidden pieces of old infrastructure are placed into the context of New York City’s vast historic narrative. It is harder to do in Portland. After all, there is so much more in New York to forget. 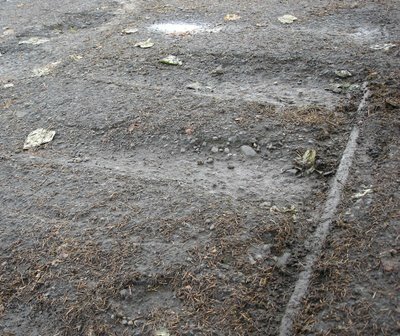 But with over a hundred sixty years of history, traces and clues do get left behind, even in areas that have been redeveloped. 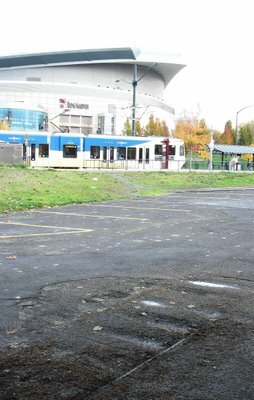 Just west of the Rose Quarter Max stop on Interstate Avenue is the site of the old Thunderbird Motel and Restaurant, an empty lot. 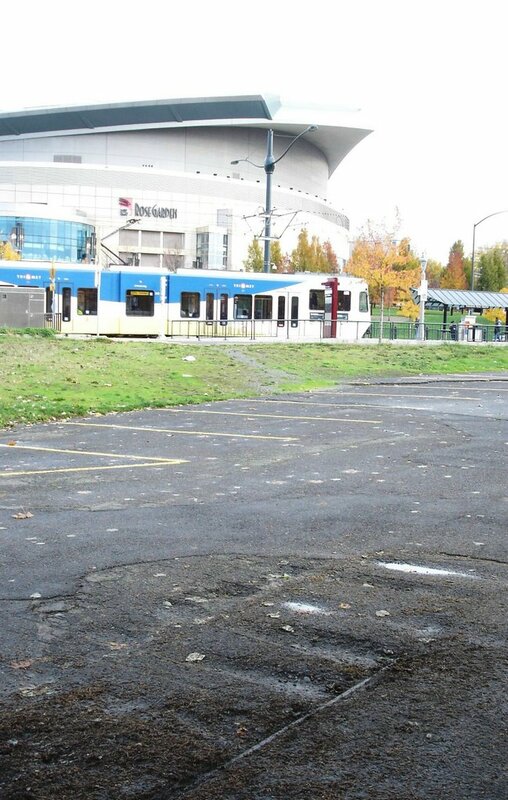 Where the lot meets a driveway that leads down to the O Dock terminal, the pavement splits in places to reveal old cobblestones and a thin line of streetcar rail. Old streetcar track is not scarce in Portland. As the street railway system was abandoned piecemeal between 1937 and 1950 it was often easier and less expensive to pave over the rails rather than remove them. 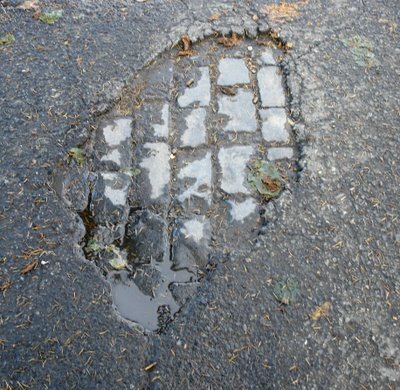 Perhaps as much as half of the old system still exists, buried under layers of asphalt, to be revealed ever so often during road work. These rails are something much older. They lead back to a time when three cities; Portland, East Portland and Albina bordered each other on the Willamette. They lead back to the era of “Stagecoach King” Ben Holladay, back to the first electric streetcar line in Portland and back to the original Steel Bridge. They also lead to a neighborhood that is almost, but not quite forgotten. 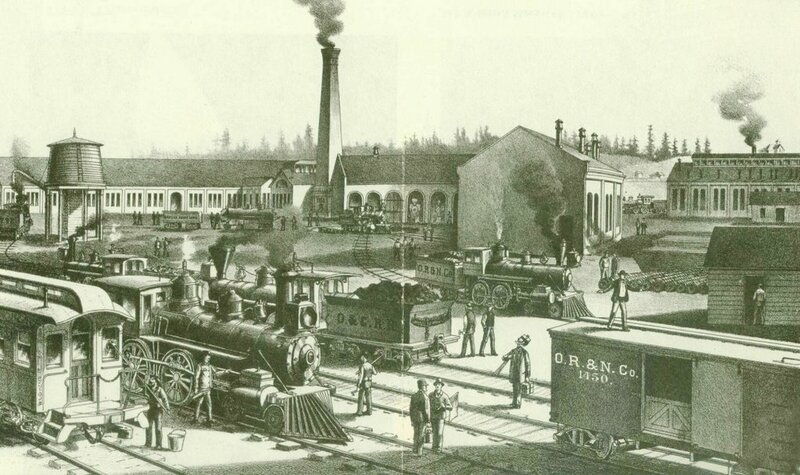 The Oregon Railway & Navigation Company's shops at Albina in the 1880s. 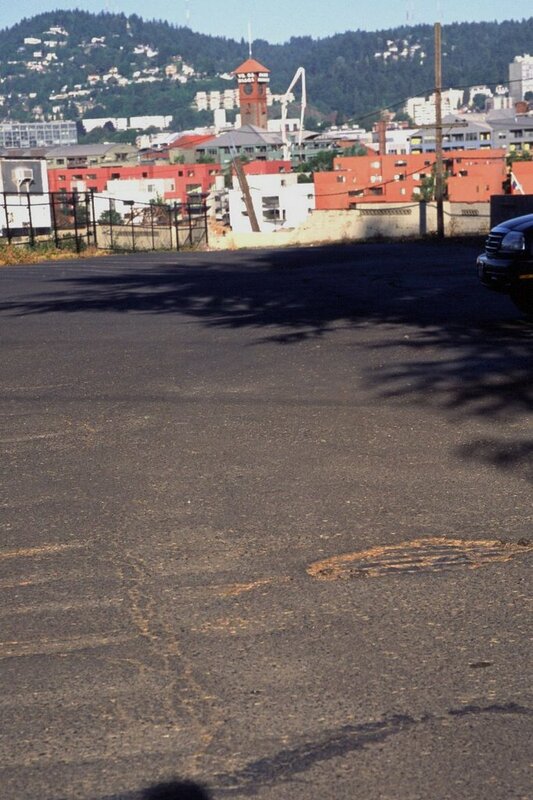 The chimney still exists today, next to Union Pacific's Albina diesel facility. 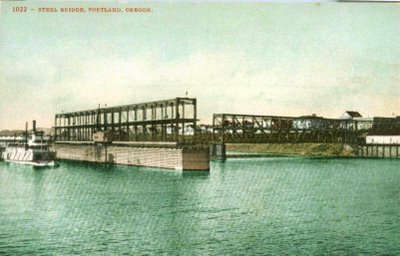 The arrival of the Oregon Railway & Navigation Company (controlled by the transcontinental Northern Pacific Railroad) in 1883 was a watershed time in Portland history. 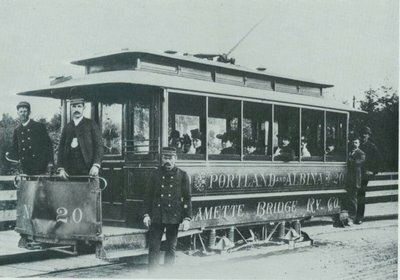 With a connection to the rest of the country’s rail system, Portland’s population would increase from nearly 18,000 to 47,000 by 1890. At the time, Portland already had two railroads which were attempting to connect with California. One, via the west side of the Willamette, was backed by much of the Portland establishment. The other, via the rivers east side, was controlled by that master of flash and finance, Ben Holladay, who was looked down on by the Portland elite as a vulgar and uncouth libertine. Ben Holladay, the "Stagecoach King". 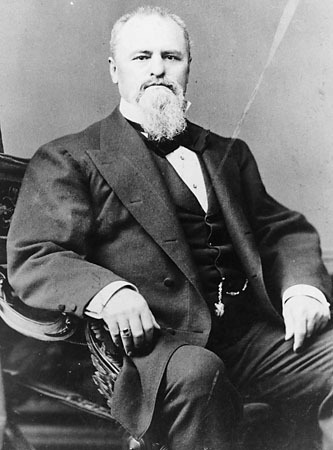 In 1873, construction of his Oregon & California Railroad got bogged down in the mountains south of Roseburg, forcing him to sell his interests to Henry Villard, who would eventually connect Portland to the east with the Oregon Railway & Navigation Company. The Oregon Railway and Navigation Company built through Sullivan’s Gulch and established yards, shops and a company town at Albina. Despite Ben Holladay’s fondest wishes, a passenger terminal was planned on the west side of the river, and necessarily, a bridge across the Willamette. In granting a franchise across the river, the City of Portland stipulated the bridge (the second after the original Morrison Bridge to cross the river) would have an upper deck for vehicle and pedestrian use. It would pivot at its center to allow the passage of river traffic. Construction began in July 1887. The bridge opened for rail traffic a year later on July 11, 1888. It soon became known as the “Steel Bridge” due its being constructed of steel. A year and a half later, construction began nearby on Grand Central Station, now known as Union Station. "Union Depot" taken from above the upper deck of the Steel Bridge, near Hoyt Street, circa 1911. The upper deck the Steel Bridge began on the west side at the corner of Third and Irving Street. It continued to Hoyt Street, gaining elevation until it met and built over the railroad tracks. There it turned east to reach the river. 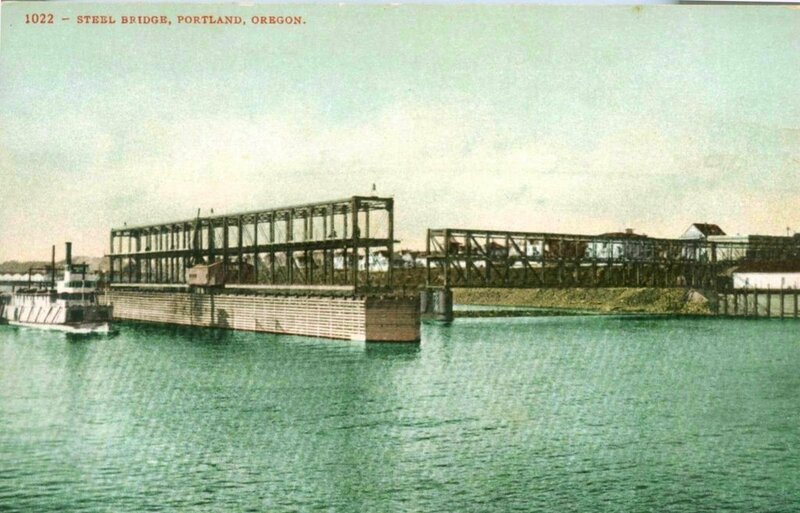 Upon reaching the east bank, the railroad veered south while the upper deck connected at street level to East Portland. 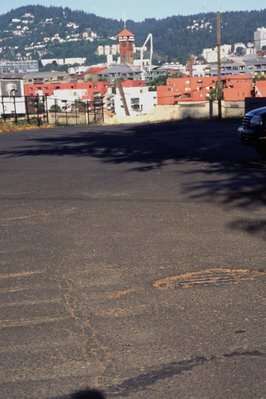 The track and cobblestones showing through the pavement are on the Holladay Street approach to the old Steel Bridge. The tracks were last used in 1912, when the new Steel Bridge was built, approximately 600 feet to the south. The east end of the old Steel Bridge. 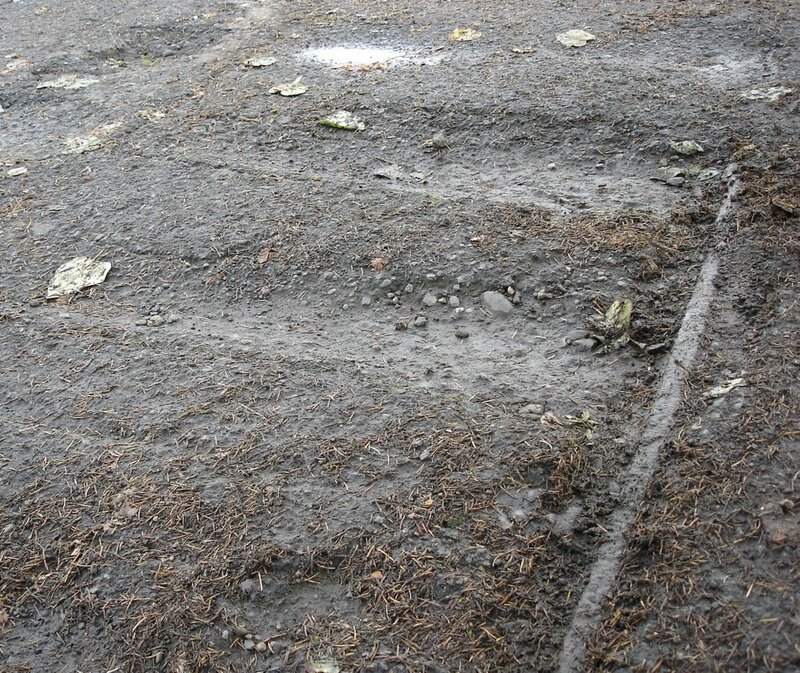 The ridges in the pavement were caused by the collapse of the rotted streetcar track's ties. Old cobblestones are to the right. Third, at Irving, where the original Steel Bridge began at ground level. The old fire station was built in 1913; one year after the original Steel Bridge was replaced by the current one. The bridge went one block north to Hoyt, gaining elevation, then east to the river. The bridge then crossed Front Street and passed within a few feet of McCormick Pier, then a part of OR&N’s Ainsworth Dock. The bottom of the upper deck of the bridge was level with the top of the buildings second story windows. The bridge continued to the river, roughly through the current gap between the two red condominiums. 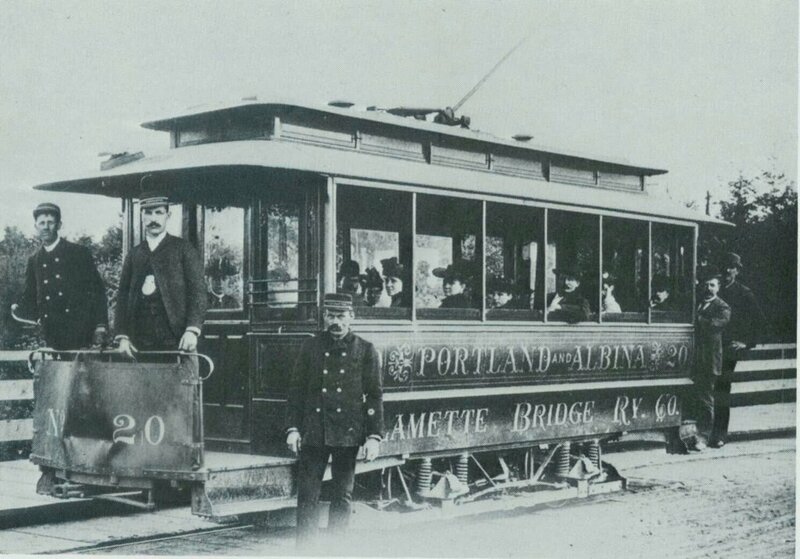 Portland’s first electric street railway line, operated by the Willamette Bridge Railway, entered service Friday November 1st 1889, on the Steel Bridge. 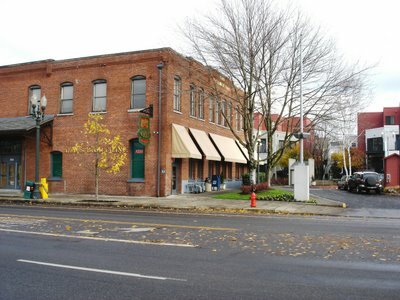 The route began at Third and Irving Street, at the west end of the Steel Bridge, and crossed the river to East Portland at Holladay Street; then it ran north to the current intersection of Interstate Avenue and Russell Street in Albina. 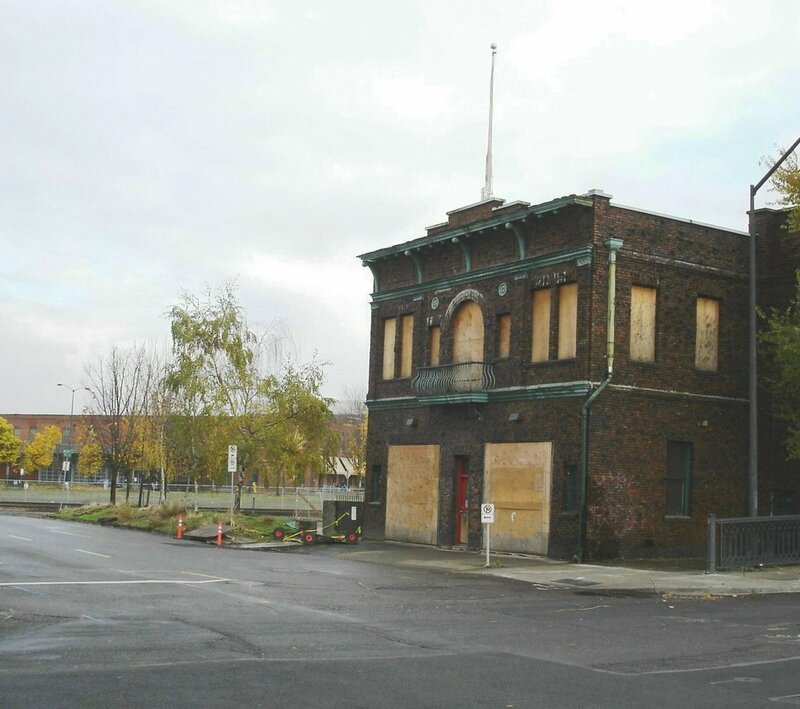 Two years later, the Smithson Block, which now houses the Widmer Gasthouse pub, was built at the intersection. The initial mile and a half long line gave birth to what, through expansions and corporate consolidations would become the great pre-World War I Portland Rail Light & Power system. - The Oregonian, Saturday November 2, 1889, describing the electric-powered streetcar trip. 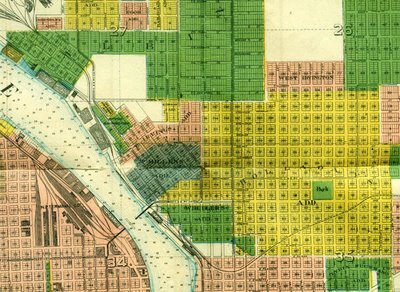 When Ben Holladay was not building railroads, buying legislators or entertaining the ladies, he was buying land, a lot of it, in East Portland. His Holladay Addition ran west from East 18th Street on both sides of Sullivan’s Gulch, narrowing to a point at the foot of the original Steel Bridge. Holladay Park, in the middle of the addition still exists beside Lloyd Center. The Holladay Addition (in yellow) and surrounding areas around 1900. Note the park in the center of the addition (Holladay Park). 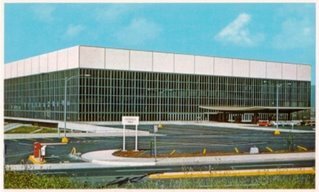 Years later, in the early 1950’s, Portlanders would decide they needed a sports complex, an idea which would evolve into Memorial Coliseum. In a conflict that Ben Holladay would certainly have understood, there was a dispute over which side of the river the complex would be built on. In 1956 the issue was decided by the voters in a referendum that favored of the east side by a margin of 303 votes. 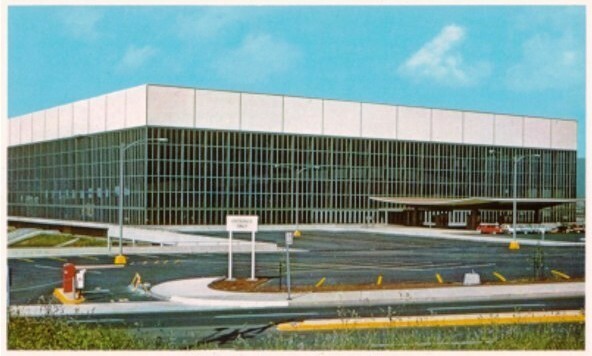 Memorial Coliseum’s eventual location between the Broadway and Steel bridges was a largely African-American neighborhood in the old McMillan’s, Wheeler and Holladay Additions. It was a working class neighborhood of houses, apartments, small stores and churches. It bordered the vital jazz club scene along William’s Avenue, described vividly in “Jumptown, the Golden Years of Portland Jazz” by Robert Dietsche, with nightspots such as the Dude Ranch, (where Lois Armstrong would play), the Savoy, the Frat Hall and Lil Sandy’s. The demolition of the area was the first of three hammer blows to Portland’s African-American neighborhoods (followed by the placement of Interstate 5 through North Portland and destruction of much of old Albina in the re-development that accompanied the building of Emmanuel Hospital). It is widely rumored that “those-in-the-know” bought up property in the neighborhood before it was known to be the future site of the Coliseum, then sold the land at great profit to the city. 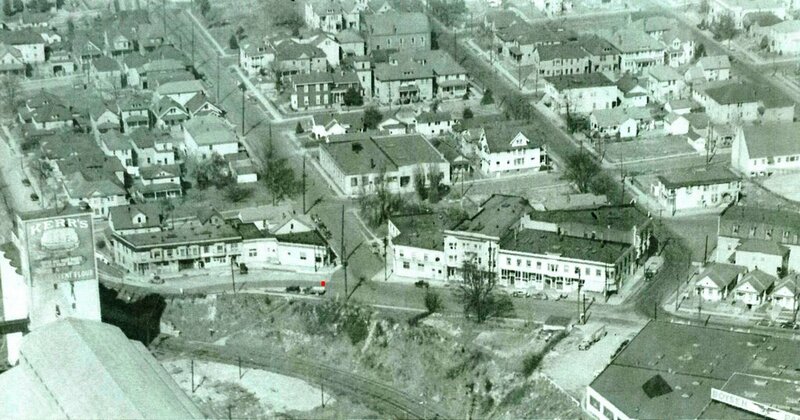 The area around Holladay Street in the 1940s. The red dot indicates the location where the rails and cobblestones are showing through the pavement today. 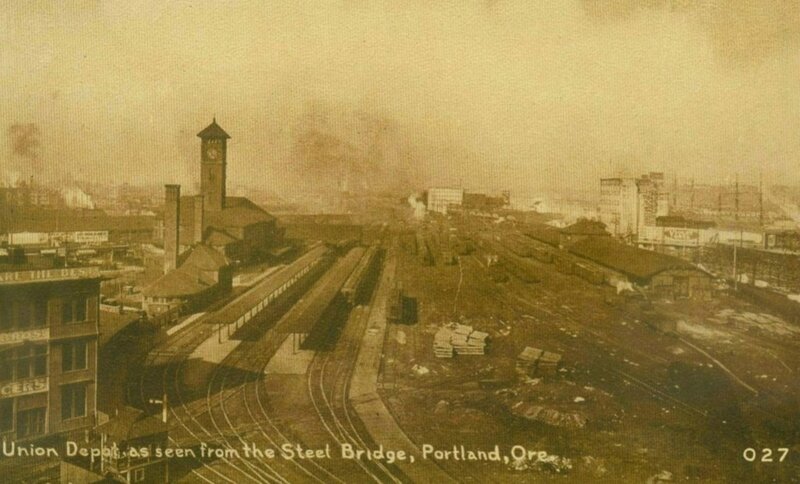 The line of paved over tracks can be traced to where the old Steel Bridge met East Portland. The grain elevator is still in place, with additional silos. Of the neighborhood very little remains. 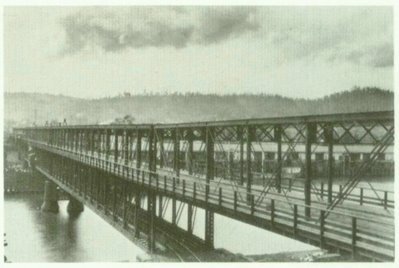 Like the original Steel Bridge, Holladay Street to the river and the Willamette Bridge Railway, it is largely forgotten. 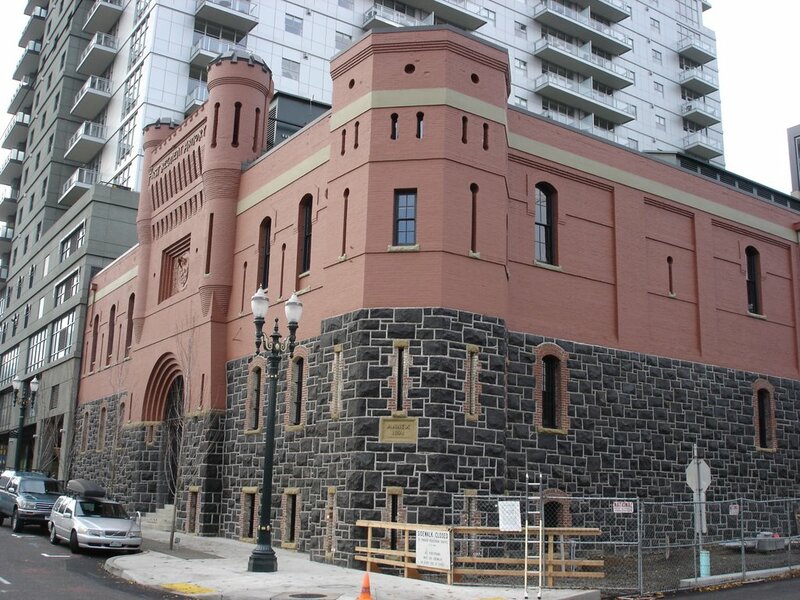 A few years ago when I first heard about the Brewery Blocks redevelopment, I began to worry about the old Armory Building. Would it be torn down? What practical purpose could a nineteenth-century stone fortification serve today? Even when the developers stated they wanted to see it preserved I was skeptical. I pictured pieces of the foundation used to decorate the courtyard of a condo tower called The Armory. I was relieved when the building was saved. A fun evening spent watching “West Side Story” finally allowed me to see it from the inside. Portland Center Stage has done a wonderful job. With its gorgeous interior, environmental innovation and historic setting, the Bob and Diana Gerding Theater at the Armory is a fine example of preservation and re-use. 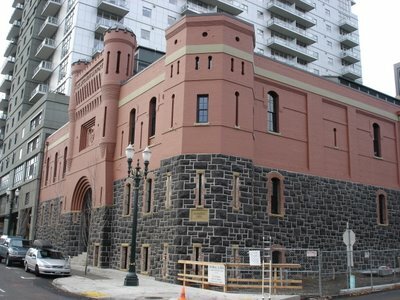 Strangely enough, it is not the first theater in Portland with a defendable perimeter. 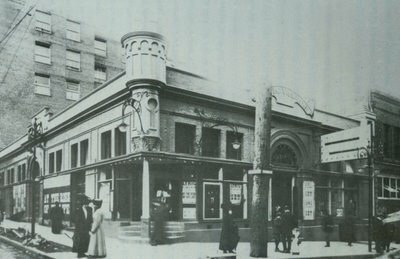 Below is the Lyric Theater at 133 Seventh (Broadway after 1913) on the corner of Seventh and Alder Street (the present location of the Bank of California Building). The Lyric was built in 1904. It was ran by Larry Keating and Daniel Flood who booked in it theatric productions by stock companies. The Lyric later was home to Pantages Theater (1912-1926). In its last two years it housed the first location of the Music Box Theater.